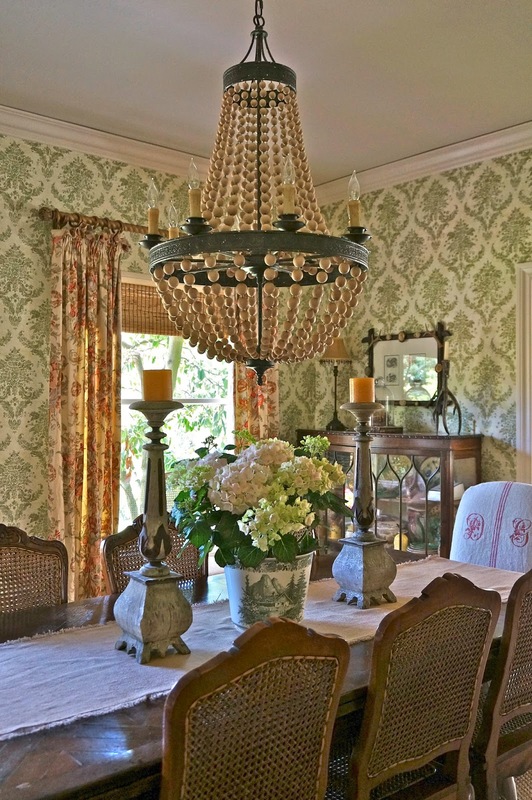 Don't worry, I have no intention of getting rid of my tole chandeliers, especially this one! I was curious though about what you all thought of tole--whether it seems "granny" or dated or just too much over the top. 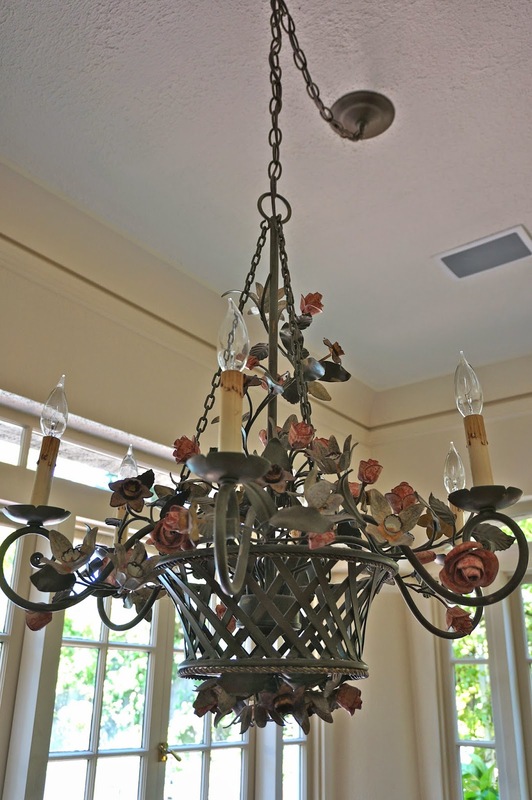 In other words, would you put a tole chandelier in your home? I believe a little tole goes a long way and that while it does fit my home, I scaled back a little when I replaced the large tole chandelier in the dining room with this wooden bead chandelier. After all, I didn't want my house to be "the house of tole!" Don't worry, I'm not going all beige on you all either! I will always love florals, majolica and romantic decor and I'm quite confident in my style and what I love. But sometimes we all need to edit and update. After all, I don't want my house to be stuck in a time warp! Because someday, this old house will be passed down to new owners who will have their own idea of how to decorate, based on how this house speaks to them. And so I'm beginning the process of not only updating, but also preparing for the time when I have to let go of this old house, and the future of new beginnings. While change is good, it's also bittersweet. Thank you so much for all your comments and feedback. Delores, We've all grown to love your home and all of your collections so much! It would be so hard to imagine parting with any of it, especially the family home! You are making us nervous now with words like "someday" and "downsizing"! It sounds like it's not that far in the future?? Our hearts will break, right along with yours, if a "For Sale" sign goes up in your front yard. But, we'll follow you, wherever you go, as long as you don't mind us tagging along on your next adventure! Oh, and don't forget to give us a big heads up when you decide you're having a "Garage Sale"! Delores I love the changes you've made but I also loved the before...your home is always filled with beautiful inspiration!! If I lived in California I would jump at the chance to buy your home! Delores, I admire your approach to all of this. You are giving me courage to accept changes that are likely in our future as well. I've long admired your beautiful style. I know that any changes you make are ones that will be just as lovely. You have the touch! Old? “Granny”? This is one of the beautiful chandeliers I have ever seen so far! My mother loves collecting chandeliers; small or big. This gorgeous one or either one of them is one of my favourite whom I love to own for my cabin! Exquisite! As a kindred spirit I can commiserate...it is hard to make decorating decisions now when all, or most, of your life you've decorated according to your taste and preference. All of a sudden, being at cross roads of having to downsize also begs a questions: do I bring all of this with me or have a HUMONGOUS estate sale and start anew. I would look at it this way: Having to downsize gives you an opportunity to decorate anew :-). Now, isn't that a wonderful feeling. Also, your home is beautiful as I am sure you've heard many times over. You will have a difficult time of what to let go and what to keep. But eventually you will take things with you that you simply cannot part with and you will get rid of what lost its appeal. Take it from an immigrant who lost everything in a war and had to start from scratch at least 3 times so far. I've lost many a collection of things I loved and adored. But everything is easily replaced and I always end up finding even better things. As long as you have your health you will be a-OK. Much love to you from rain NYC. Not only do I adore your wood bead chandelier!!!!! I own it!! Or it's twin! I will publish it! I found mine at an antique "show"!! My suggestion!! Get thee on ebay! Don't let those treasures wilt away in your garage!! Share them! There are people who can help you for a percentage; but, you are so good at taking pictures! Get that great stuff out onto the marketplace! These treasures could be making other people really happy! I believe in recirculating great stuff! !